A passer-by looks at a TV screen reporting news about North Korea's missile launch in Tokyo, Japan, Sept. 15, 2017. North Korea launched another missile over Japan early Friday, just days after the United Nations imposed additional sanctions on Pyongyang for conducting its sixth nuclear test. The missile was launched from the Sunan district in the North Korean capital of Pyongyang, and flew over the northern Japanese island of Hokkaido, Yoshihide Suga, Japan’s chief Cabinet secretary, said. "We absolutely cannot accept these repeated provocations by North Korea and we strongly protest to North Korea and convey to them the nation's strong anger in the strongest words possible,” Suga said. 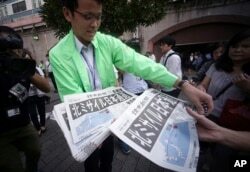 A man distributes an extra edition of a newspaper reporting about North Korea's missile launch, at Shimbashi Station in Tokyo, Sept. 15, 2017. Warning announcements about the missile blared around 7 a.m. local time in the northern Japanese town of Kamaishi, according to footage from national broadcaster NHK. South Korea's military reported the missile reached an altitude of about 770 kilometers and flew 3,700 kilometers, far enough to reach the U.S. Pacific territory of Guam. The U.S. Pacific Command said in a statement, “Initial assessment indicates the launch of an intermediate range ballistic missile (IRBM)” that did not pose a threat to Guam. The North American Aerospace Defense Command (NORAD) determined this ballistic missile also did not pose a threat to North America. U.S. Defense Secretary Jim Mattis said the North Korean missile launch "put millions of Japanese into duck and cover," and that top U.S. officials had fully coordinated after the test launch. Mattis spoke to reporters during a visit to the U.S. Strategic Command, which oversees U.S. nuclear forces. The South Korean military responded to the provocation from the North by launching a Hyunmoo-II missile into the sea that traveled the distance it would take to reach the Sunan airfield in Pyongyang, according to a military spokesman. South Korean President Moon Jae-in also convened a National Security Council (NSC) meeting to monitor the security situation and prepare for any new emerging threats from North Korea. “President Moon ordered (the military) to closely analyze and increase the readiness posture against new type of threats from North Korea, such as EMP (electromagnetic pulse) and biochemical threats,” presidential spokesman Park Su-hyun said. 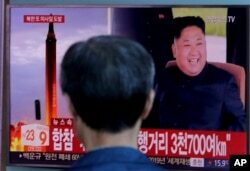 A man watches a TV screen showing file footage of North Korea's missile launch and North Korean leader Kim Jong Un, at the Seoul Railway Station in Seoul, South Korea, Sept. 15, 2017. North Korea said earlier this month it was developing a hydrogen bomb that can carry out an EMP attack. Experts disagree on whether the North would have the capability to mount such an attack, which would involve setting off a bomb in the atmosphere that could cause major damage to power grids and other infrastructure. The United Nations Security Council will meet later Friday on the latest North Korea missile test, diplomats said, at the request of the United States and Japan. Pedestrians look at a television screen broadcasting a news report in Tokyo, following a North Korean missile test that passed over Japan, Sept. 15, 2017. Japanese Prime Minister Shinzo Abe has called for new sanctions “to be firmly imposed” in response to this latest North Korean missile test that violated Japanese airspace. “North Korea has trampled over the strong will of a united international community to a peaceful solution as seen in the United Nations' Resolutions the other day. We absolutely cannot accept these provocations,” Abe said. In August, North Korea also launched a ballistic missile over Japan from a region near Pyongyang that flew more than 2,700 kilometers at a maximum altitude of around 550 kilometers. The 15-member Security Council, which includes U.S., China and Russia, unanimously imposed sanctions against North Korea on Monday for its September 3 nuclear test that prohibits textile exports, reduces oil and gas imports, and limits permits for North Korean laborers to work outside the country. In August the Security Council also imposed a ban on North Korean coal, iron, lead and seafood exports. In the last round of sanctions, however, Washington was unable to get Beijing and Moscow to agree to a total oil embargo and authorization to interdict ships suspected of smuggling banned items. U.S. Secretary of State Rex Tillerson also called for "new measures" against North Korea and said "these continued provocations only deepen North Korea's diplomatic and economic isolation." The North Korean state run newspaper Rodong Sinmun on Friday said in an editorial that "if the U.S. continues to walk on the current course, we will take stronger actions for our self-defense." 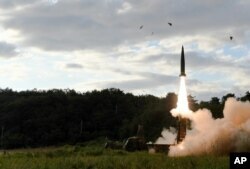 In this photo provided by South Korea Defense Ministry, South Korea's Hyunmoo II ballistic missile is fired during an exercise at an undisclosed location in South Korea, Sept. 15, 2017. In the past two years, North Korea has conducted 27 ballistic missile launches and three nuclear tests. At the beginning of this year, North Korean leader Kim Jong Un announced plans to develop a long-range ICBM nuclear missile that can target the U.S. mainland. The Trump administration has called the development of a North Korean ICBM an unacceptable existential threat. Washington has tried to work with Beijing to restrain its ally in Pyongyang through economic sanctions. While U.S. officials say they prefer a diplomatic solution to this nuclear standoff, military force is also an option.